Coming into town as a typical labor union wouldn't do any good. To build community power, we would have to create a movement. 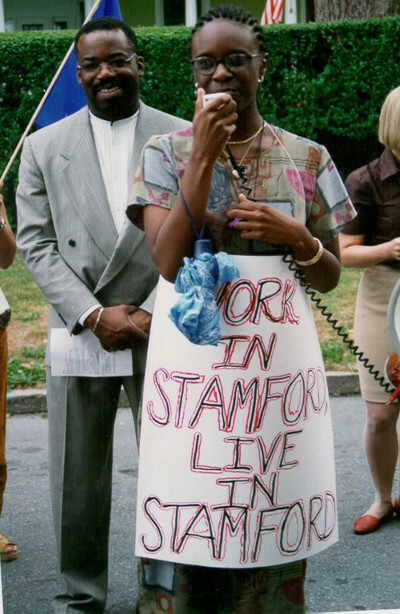 Fairfield County, Connecticut, was a region where Fortune 500 companies held absolute political power. They’d convinced the population to be thankful to corporations for creating jobs and “cleaning up” the area. Fifty minutes by train from Wall Street, Fairfield County had the highest number of unorganized workers in the state — in some sectors, the highest in all of New England. 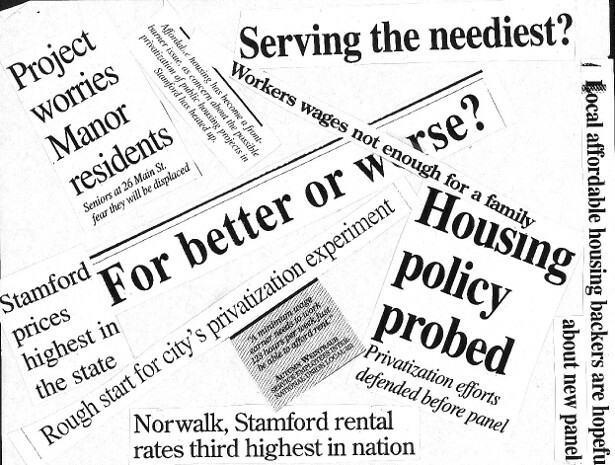 There was an acute housing crisis, and simmering racial tensions abounded. As in much of the United States, there was no organized independent progressive power base with which unions could ally. I was sent there in 1998 by a national labor federation to work with four local unions and experiment with ways to improve the rates of success for union organizing. It seemed like an almost impossible assignment. Several strategies seemed obvious to me, however. First, we’d have to find creative ways to expose the corporate agenda in the area. Conventional union campaigns would not be sufficient, given the local population’s lack of contact with the labor movement. I suggested that affordable housing in particular, and racism more generally, would be the key issues; across the board, workers said housing overshadowed all their other concerns. But before we could get anywhere we’d have to win over the African-American churches, which held serious political and social power, though we knew that they were hostile to unions. Coming into town as a typical labor union wouldn’t do any good. To build community power there, we would have to create a movement. One clear way to change this relationship would be to change our behavior; this meant helping people take on the housing crisis, not just helping workers form unions. No matter how much workers might win in wage and benefit improvements through collective bargaining, the cost of housing would still condemn them to poverty. Representing the interests of these workers meant rethinking the role labor unions might play in such communities. It also seemed abundantly clear that the professional union staff would not be the people to persuade powerful black ministers that unions could be a good thing. Rather, the key to establishing relationships that would be sufficiently powerful to challenge corporate dominance was a transformational organizing model. Enter Joan Phang. Joan was middle aged, black and a certified nursing assistant. She was also a single mother who didn’t have time to waste, and she let us know it. Idle chit-chat turned her off instantly. She demanded to understand just how she and her co-workers could win, given the poor odds workers stand for forming unions in the United States. Through intensive one-on-one conversations with us and fellow workers, Joan transitioned from fearing employer reprisals to becoming a leader in the effort to unionize her nursing home. We took time to understand where Joan was coming from, who she was, how she understood her place in the world and what mattered to her. This enabled us to help her realize that collective action was the only way to resolve her own problems. Conversations like these require time, patience, listening skills, deep respect for ordinary people and genuine curiosity. Face-to-face discussions are the foundation to successful organizing; they are designed to help individuals overcome their sense of helplessness and fear, and recognize that a rigged system is to blame for most of their ills, not themselves or their family, and leading to a broader sense of self-interest. Shortly after winning the union election, however, Joan brought a letter to the union office that had been slid under her door at home. It was the kind of letter that a lawyer had written to obscure the real meaning of the words. We discovered that the city planned to first privatize and then demolish Joan’s entire middle-income public housing complex, an assortment of 168 lovely, two-story homes built close to the ocean years earlier when land pressures weren’t as acute. The earth under Joan’s housing was now considered prime development land. Within days, we mapped all the relationships that Joan, her newly unionized coworkers and, now, Joan’s neighbors already had in the area. A rich topography emerged. The workers and public housing residents were members of many of the area churches — the same churches the unions would need if we had any hope of winning the kinds of gains the workers so desperately needed. It turned out that Joan Phang’s daughter Nicole, who lived with her, was active in a particularly powerful church, Faith Tabernacle Baptist Church. Nicole was attending a local community college, which made her mom blush with pride. She also seemed born to hold a bullhorn — young, confident and clear in her convictions. Before long, Nicole became a leader in the campaign to save her home. Thanks to Joan and Nicole, we had housing residents, powerful churches and newly organized union workers in one big struggle to improve their quality of life at home and at work. Because the union didn’t see Joan just as a worker, but entered into a direct relationship with her and her daughter through the housing fight, Nicole helped to bring along other housing residents and her minister. Joan, like several other residents of the housing complex, developed a lot of leadership skills in the fight to win their new union. They then tested their new skills by leading face-to-face, door-knocking campaigns throughout the community, asking residents to come out to summertime backyard meetings to plan to save their housing. From there, they mobilized church-going tenants to meet with their ministers and fellow congregants to discuss the housing campaign. These new union members were developing multiple new identities — union leader, tenant leader, church leader and community leader. In the end, the workers won a tremendous contract, the housing development was saved and the coalition won public funds for long overdue improvements for the public housing development where Joan and Nicole lived. The kind of organizing I just described is an effort to bring ordinary people, many of them previously uninvolved in civic-anything, into collective action. The people who take part can have no education, little education or lots; they can be of any ethnicity and gender; they cross class lines, including poor people, working and middle class, and the short- and long-term unemployed. Organizing, take note, is distinct from the practice of mobilizing, which is generally carried out by paid professionals to get the already-organized into on-going, strategic, targeted collective actions. Mobilizing is also different from activism — a sort of all-inclusive category of individuals and small groups who are doing something, including things like lawyering on behalf of abused people, letter-writing, standing alone or with a few people on a street corner with a sign, or sending money to Greenpeace. Activism may or may not be in conversation with others. Organizing always is. This past year, the Chicago teachers’ strike was an excellent example of transformational, whole-person organizing. Step one in their struggle was that a slate of radical teachers challenging the old guard of the union had to win the leadership in the internal elections. Next, like in Fairfield County, they had to analyze and understand the power players in their upcoming contract campaign, including the power of Chicago’s new mayor, none other than Rahm Emanuel, the former chief of staff to President Obama. When the newly minted progressive teachers union decided to take on a powerful Democrat, the stakes were high. Ultimately, the teachers in Chicago won their strike by first rebuilding their union internally and then building intentional bridges between teachers and their own communities. Teachers spent the summer before the strike systematically reaching out to their organic ties in their own communitiesin a process similar to the one we used in Connecticut. Teachers themselves came to better understand the relations they already held in their community. All along, the teachers set out to educate parents and community leaders, not just children, about the coming attack on public education and public educators. In short, Chicago’s teachers built a movement, not a narrowly defined union. By embracing the fight to defend Chicago’s kids, parents and schools — and by taking on a powerful Democrat — they provided yet another example of deep, relational, transformational, community-based approaches to union organizing. If more of the union movement understood their members as whole people, not simply as “workers” — and if more civil society groups understood the urgent issues their members face at work and actively support them in efforts to unionize — we’d be well on our way to challenging the corporate takeover of the United States and the world. There are no shortcuts to building the kind of power it takes to win meaningful change. Face-to-face organizing is fundamentally about developing and unleashing the primary source of power available: ourselves.